There is one event and one name through which is Brno generally worldwide recognized. The name is Josef Gregor Mendel, the father of genetics, and the event is the Napoleonic battle of Austerlitz also known as the Battle of the Three Emperors. The battle, regarded as the greatest victory of Napoleon Grand Army which changed the map of Europe and its history, took place in the region to the east of Brno on December 2 in 1805. Everyone has heard at least once in a lifetime the name of Napoleon, the famous French Emperor who ruled over the Europe since 1799 until 1813. The European powers considered Napoleon to be a great danger for their Empires and they created several coalitions followed with battles in order to eliminate Napoleon. The event which preceded the Battle of Austerlitz happened exactly one year before on December 2 in 1804 when the lifetime Consul of the French Revolutionary Republic Napoleon Bonaparte had himself crowned Emperor Napoleon I. The European powers felt in danger, namely the Great Britain, which instigated to create anti-French third coalition in order to move the French threat further away from the Channel coast where a large French force was ready for invasion to the Great Britain. The third coalition was joined by Russia and Austria. In summer 1805 alliance forces moved to the west while Napoleon army marched to the east. On November 18 Napoleon entered Brno while allies withdrew towards Olomouc. Napoleon was well known for his excellent battle strategic he based on deep studying of the terrain. After studying the terrain between Vienna, Brno and Olomouc he decided that the decisive battle between Grand Army and Allies would take place in the country between Brno and Austerlitz (today Slavkov u Brna). Napoleon pretended weakness and vulnerable and he lured enemies to the trap. On December 2, the initial attacks started near Telnice municipality at 08 AM. The battlefield covered an area of 120 km2 and affected 25 communes. The centerpiece of the area was the Prace Heights where today a monument of Cairn of Peace is today placed. At 09 AM Napoleon ordered an attack on the Prace Heights, saying, “One sharp blow and the war is over”. The success of the French army beside good tactics and strategy, their mobility and pretending weakness was ensured by weather too. A legendary dense fog helped to cover French troops until last time when they cropped up in front of the Russian troops placed on the Prace Heights. It was a moment of surprise. In several hours it was over but the consequences of the battle persisted far longer. During the battle 72 000 French soldiers faced to 85 000 soldiers of Allied Army. Casualties are not easy to quantify but it is estimated that around 26 000 were dead or wounded or captivated and declared missing. The dead bodies were mostly interred into mass graves whose location today we do not know. It is believed there about 22 mass graves across the battlefield. Many wounded soldiers were lying abandoned on the fields and were slowly dying. “We are babies in the hands of a giant ” proclaimed Russian Tsar Alexander leaving the battlefield. The Austrian Emperor Franz I said “The British are dealers of human flesh. They pay others to fight in their place”. William Pritt, the British Premier referred to a map of Europe, “Roll up that map; it will not be wanted these ten years.” Europe found itself in the sheer amazement and in fear from the consequences of the peace treaty. On December 4, Napoleon and Austrian Emperor Franz I met at Spaleny Mlyn (Burnt Mill) where Napoleon proposed very hard peace conditions. The armistice was signed on December 6 and peace treaty on December 26 in Bratislava (Slovakia). Austria lost extensive territories of 63 000 km2 and had to pay 140 million francs in reparations to the victor. The Holy Roman Empire ceased to exist, and France became the superpower in Europe. Nowadays, this historical event is commemorated every year in form of cultural events, lectures, exhibitions and commemorations on the battlefield. 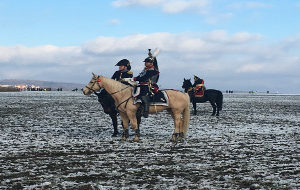 The climax of the commemorating is the reenactment the battle of Austerlitz on December 2 in Tvarožná attended every year by 1000 volunteers from all around the world. If you would like to learn more about this event and visit places were once all Three Emperors stayed and which played important role in the course of the battle, you can sign up for the trip to Austerlitz Battlefield.